Our carbon bellcranks are molded with high-temp epoxy and continuous carbon tow. The weight of these bellcranks are between 7 and 8 grams each without the leadouts and pivot post. The installed weight will depend on how long the pivot post is and the type of leadout material used. The leadout holes are bushed with 3/32 inch ID brass and the pivot post is 1/8 inch music wire. The pivot bushing is oil impregnated bronze to provide a smooth long lasting bearing surface without any wobble to last thousands of flights. The pushrod bushing is machined to tight tolerances from phosphor bronze to provide a slop free fit with 3/32 inch music wire. If a Rocket City ball link is used the pushrod bushing can be tapped to accept the 4-40 bolt. If this method is used a 4-40 lock nut will need to be added to the 4-40 bolt. 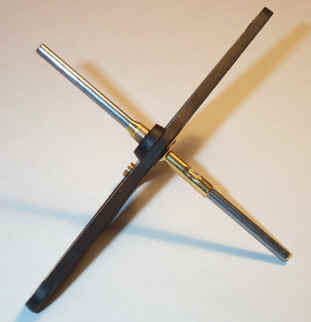 The bellcrank is positioned on the pivot post by two retainers. The large retainer supports the bellcrank from the bottom while the small retainer is at the top. The best way to install the retainers on the pivot post is to use JB weld epoxy. When solder and flux is used there is the chance of contaminating the bearing and pivot post with flux. If the flux is not neutralized it will cause the music wire to rust. JB Weld is a high temp aluminum filled epoxy that adheres well to steel. The low weight and tight tolerances of this part make it a natural for today's modern aerobatic aircraft. 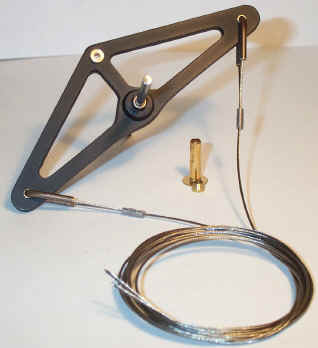 This is the same bellcrank except that the 19 strand 1/32 inch diameter stainless steel leadouts are attached. The breaking strength of these cables are 185 pounds. Since there are two leadouts the breaking strength will double to 370 pounds. The leadouts run through a brass tube to provide a smooth bearing surface. Whenever cable leadouts are used it is important that they are bushed to prevent them from sawing through the bellcrank material. The crimping ferrules will withstand the full breaking strength of the cable. This cable is extremely smooth and flexible and will provide thousands of flights. This close-up of the bellcrank assembly shows the positioning of the retainer bushings with the small turned bushing on the top and the large flange bushing supporting the bellcrank from the bottom. These retainer bushings are a tight slip fit to allow them to be positioned during assembly. The best way to install the retainers on the pivot post is to use JB Weld epoxy. When solder and flux is used there is the chance of contaminating the bearing and pivot post with flux and a risk of corrosion or rust exists. JB Weld is a high temp aluminum filled epoxy that adheres well to steel. Remember to clean the area where the epoxy is to be applied with 320 grit sandpaper.